Why do teams employ failed dopers? It seems that Ricco, or 'the little winker' as I like to call him, is coming back. His ban is up next year and he'll be riding for Ceramica Flaminia. Well that at least is his plan and maybe it's Flaminia's plan. Maybe they are after some cheap publicity and to honest there's no publicity cheaper than claiming you're going to sign some toxic waste for the coming season. But who's the fall guy here? Well it's cycling of course, the sport I love with a passion that has long passed the insane. The sport to which I devote hundreds, maybe thousands of hours a year, coaching, riding, watching, reading about, end even blogging about. So as you can imagine, there is a slight lack of amusement in Onthebanking towers. Why do teams keep employing failed dope cheats? That's the one question I'd like to know the answer to. Seriously what do they gain from increasing their toxicity rating? Publicity maybe? or maybe it's just a chance to take the piss out of the ordinary fan at the road side? 'Yeah, we know he's a cheat and a doper, but hey, it's our team and there ain't a thing you can do about it'. That sort of attitude really, really pisses me off. So what's the answer, fan power maybe? 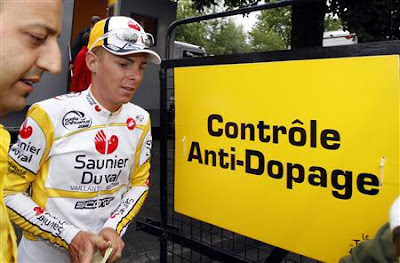 Maybe it's time to start using the web to slag off teams that re-employ failed dopers? Maybe boycott their products? Maybe write to the press? Contact race organisers and politely request that teams with toxic riders be kept off the start line, Maybe write to the UCI.... whoops, sorry about that last one, I meant to list things that could be useful. Of course teams have a right to employ who they like and equally I have a right to slag them off for doing so, it's a free world. But if one of the drivers for continued doping is having a nice 2 year holiday then getting your old job back. That is no deterrent, never has been and never will be, if the UCI or anyone thinks differently they are just, well, they are just jolly silly if you ask me. So, as there is no likelihood of life time bans and the powers that run our sport seem incapable of organising a piss-up in a brewery, let alone taking any coherent action against dopers maybe the next step is for pissed off fans to do something? And it's (oval) balls to the UCI. Now I'm well partial to a little Rugby League, or Footy, as Mr McEwan would call it. Any way, like cycling the 'Footy' has had it's drug run ins and busts, although nothing like as spectacular as ours, but it has given it a good go. Recently Gareth Hock failed a routine test, his drug of choice happened to be Boonens drug of choice. But that's where the similarities end, the footy authorities have said there will be a 2 year ban if the B sample comes back positive. Now a casual observer could well ask a question here, so now dear casual observer, please feel free to ask the obvious question. Thank you. Tom is of course allowed to race, well I say allowed to race, only in certain races that is, only it would seem in races that don't have a super high media profile where marketing opportunities could be damaged by having a coked up party boy on the start line. This of course means work, and well paid work at that, for the army of lawyers that follow cycling's drug stories with a magnifying glass in the hope of drumming up some business, we've yet to let them down and from the looks of things I suggest you steer your kids into the law rather than the bike racing game when future careers are on the table.